Target 1 Machine-Type monster in your Graveyard with 3000 or more ATK; Special Summon that target in face-up Defense Position. You can only activate 1 "Special Schedule" per turn. 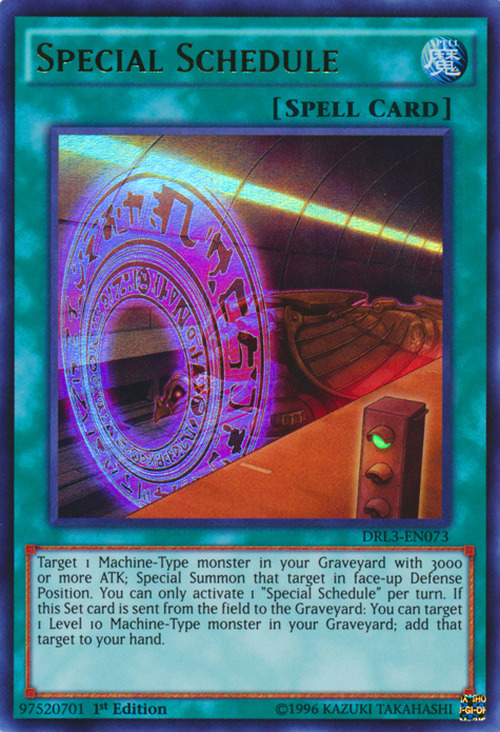 If this Set card is sent from the field to the Graveyard: You can target 1 Level 10 Machine-Type monster in your Graveyard; add that target to your hand. The artwork of this card contains the Yu-Gi-Oh! ZEXAL Graveyard portal. Ancient Gear Gadjiltron Dragon appears in this card's artwork, and can be Special Summoned by its effect. This effect can be activated even if this Set card is sent to the Graveyard during the Damage Step. Even if the "Target 1 Machine-Type monster with 3000 or more ATK in your Graveyard; Special Summon that target in face-up Defense Position." effect was activated, the effect that activates if this Set card is sent to the Graveyard can still be activated during the same turn.